40 days after Neda Agha Soltan's murder, thousands of Iranians have gathered at the graves of those killed by Ahmadinejad's government. 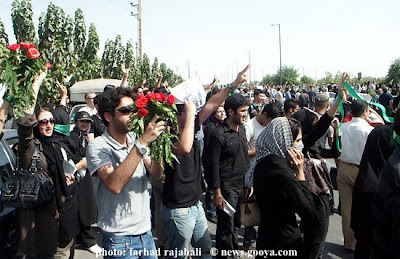 Today, at least 3,000 mourners pushed past riot squads to lay flowers on Neda's grave. 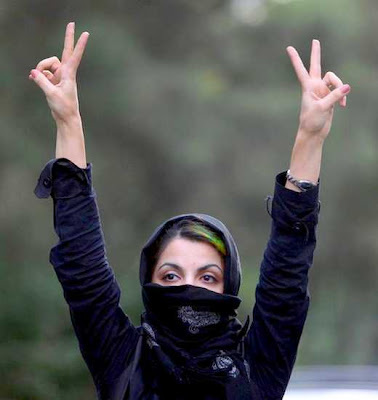 A chant heard at Behesht-e Zahra cemetery today declared, "Neda is not dead. This government is dead." 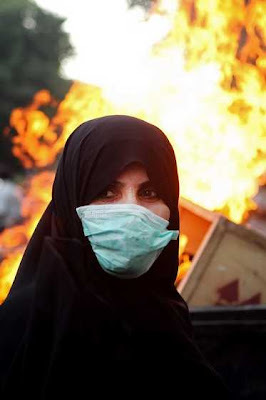 The Los Angeles Times reports that the security forces, after an initial flurry of arrests in and around Behest Zahra, retreated from the growing crowd. Noted Iranian filmmakers Jafar Panahi, Mahnaz Mohammadi, and Rokhsare Ghaem Maghami were briefly arrested then released. Karroubi walked towards Neda Agha Soltan’s resting place, surrounded by a large group of people. The special forces attacked him and tried to disperse and separate the people from “the reform sheikh” [Karroubi] by beating them with clubs and pepper spray. The police encountered stiff resistance from the people, and Karroubi held his ground and stated strongly that he is staying in this place. Karroubi sat beside Neda Agha Soltan’s grave and accompanied the people by reading the Fateheh [the prayer for the dead] for Neda. The Prayer was read with protest intonations. Afterwards Hojjatoleslam Hadi Ghaffari joined Karroubi and spoke to the people for a few minutes. 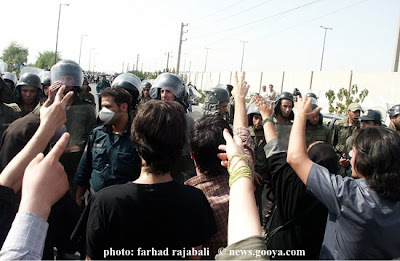 During Karroubi’s speech, the security forces had a conflict with the people and arrested some individuals. These forces were confronted with slogans like “let him go, let him go” and flowers by the people [police presumably released those arrested]. 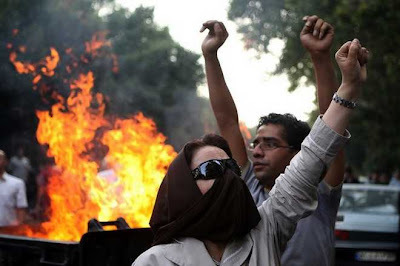 From the Los Angeles Times: "Thousands of protesters continue to mourn Neda Agha-Soltan and other protester deaths in Iran. 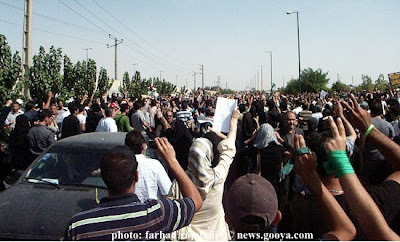 Amateur video taken near Behesht Zahra cemetery shows an endless sea of mourners chanting Mir-Hossein Mousavi's name, waving green pieces of fabric, and holding up victory signs." From the Los Angeles Times: "Protesters have been making use of the metro system, which runs next to Behesht Zahra. Here, protesters riding the metro chant "Death to Russia" and "Death to China" to the tune used to support the Esteghlal soccer club in Tehran." Sussan Deyhim sings at the United for Iran Rally at UCLA on July 25, 2009. Sussan Deyhim's set was the most soul stirring moment of the evening. I could feel Rumi under the evening sky. A crescent moon hung above us giving this gathering for Iran a celestial blessing. "My son Luke has been a great example to me of living right side up. Luke’s never met someone he didn’t want to greet. Over his 22 years of constant illness Luke has perfected living for today. Luke’s greatest joy is in making someone smile." "What Luke shows me is that living right side up spreads blessings all around you. He makes you feel good. So the whole community rejoiced when he had a successful double-lung transplant last year and had 12 great months of walking and feeling strong. He’s had serious setbacks this last month and is recovering slowly over at the University of Washington Medical Center. Knowing the greatness and fragility of life as it shines in Luke makes me want to share in it, right side up." 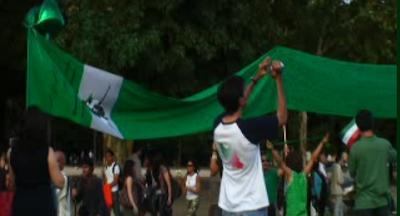 Supporters of the Iranian people in Ouagadougou, Burkina Faso. Ouagadougou, originally uploaded by United4Iran. U2 performing Sunday Bloody Sunday during their 360 degrees world tour in Dublin on July, 24th, 2009. 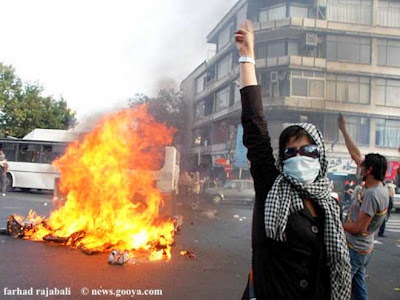 To the People of Iran: "We have heard your voices. We are with you!" Reza Aslan - "Stand Up for Iran"
In Los Angeles a coalition of student organizations, United4Iran.org, Levantine Cultural Center and others are presenting an evening of music, poetry, speeches and solidarity messages on Saturday, July 25, from six to nine pm. Among the presents/performers are Sussan Deyhim, Maz Jobrani, Mamak Khadem and Naked Rhythm. The two most prominent living Iranian poets, Ismael Khoie, and Simin Behbahani, who lives in Tehran, have joined the Global Day of Action. 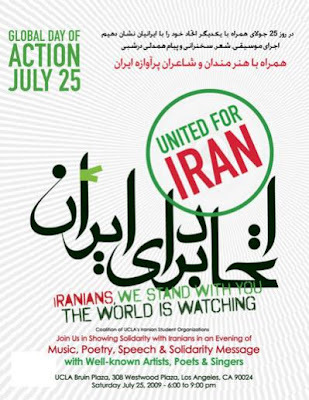 Dariush, socially conscious singer and Iranian cultural icon, will perform at the Washington D.C. United4Iran rally. Desmond Tutu, Shirin Ebadi, Mairead Maguire and Jody Williams are available for interviews. 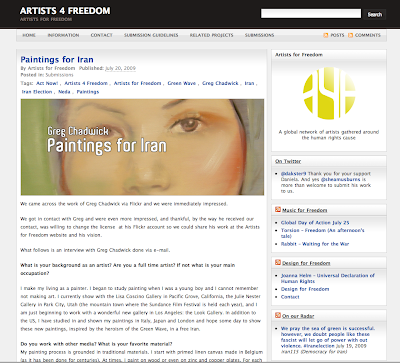 I am eager to share with you an interview I did with Artists 4 Freedom on my paintings for Iran. Here's the link. Please feel free to comment on the site. As the protests simmer and rage in Tehran, the arts in Iran are exploding and seeking solidarity with the outside world. 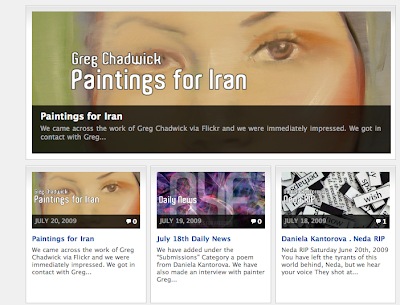 The response to my paintings concerning the recent events in Iran has been strong and dialogues have begun to emerge. The website Bar-Ex picked up my interview on my paintings for Iran and I was privileged to hear a broad array of new important music from Behind the Iran curtain. I am reminded of the band "The Plastic People" and the works of playwright Václav Havel in Czechoslovakia and their artistic efforts to break down their Iron Curtain. In Iran today we have the singer Maral who has created a haunting and powerful song for the memory of Neda, who was murdered last month by the Basij on the streets of Tehran. Fittingly, Maral also lends vocals to the band,"The Plastic Wave." In Maral's lyric "Neda screams through her eyes of her pain" as Maral "cries of her own pain through Neda's name." The word Neda means "the call" in farsi or at times evokes the idea of "the voice." I wrote Maral not long ago and expressed to her my dream that one day soon she may sing her song for Neda beneath my painting The Call - ندا -Neda in a newly free Iran. U2 Amsterdam July 21, 2009, originally uploaded by u2log.com. 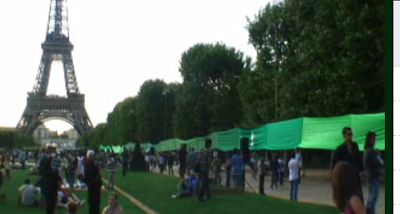 U2 adds images of the protests in Iran to the live presentation of Sunday, Bloody Sunday. "Our private lives continuously intersect with the history of our time." 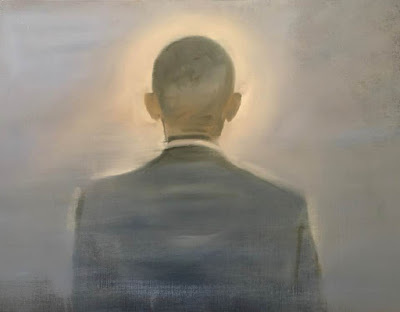 Gregg Chadwick Interview With "Artists 4 Freedom"
They are doing important work. In the first segment check out Bono as he squirms "Stop! Oh, no!" when Ross airs a clip of U2 doing "Street Mission" on TV in 1978. The highlight of the second segment is the story of Barack Obama's witty comment to Bono at a prayer breakfast in DC when Bono attempted to evade then President Bush's photo op. Obama's words to Bono,"Nice work with the hug dodge." Rafsanjani,"Leave the people if they do not want you." "The Imam [Khomeini] would always quote the Prophet [Muhammad] who would say to Ali [Muhammad's successor]: leave the people if they do not want you. Tehran University's prayer hall has been the stage for high drama since the early days of the Islamic revolution, and Hashemi Rafsanjani'sappearance today was another of many electrifying moments in Iran's recent history. Surrounded by heavy security under the cantilevered roof, the former president spoke out in public for the first time since last month's disputed election, warning that the country was "in crisis." That may be a statement of the blindingly obvious – but it carries force precisely because of Rafsanjani's special place in Iranian politics: he is both hugely influential and deeply unpopular, a bitter rival of the supreme leader Ayatollah Ali Khamenei and – crucially – one of the surviving giants of the revolutionary era. Whatever he said, his very presence at such a tense time would have guaranteed rapt attention – one reason why his sermon was not, as is usual, broadcast live on state TV whose cameras are mounted permanently in the university mosque. 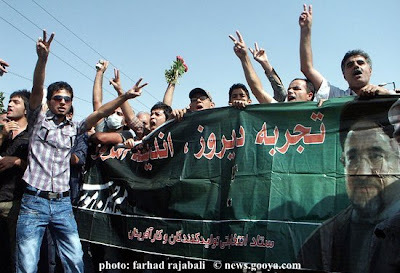 The sense of excitement was heightened because of the presence of Mir Hossein Mousavi, who claims to have beaten Mahmoud Ahmadinejad on 12 June and who rejects the election result as "illegitimate." His fellow candidate, the reformist cleric Mehdi Karoubi, was also there. Rafsanjani's calls to restore trust by releasing prisoners, freeing the media, using only legal means, and by dialogue between opposition and the regime, were couched in the language of legitimacy and justice. "Don't let our enemies laugh at us by putting people in prison," the cleric urged. "We must search for unity to find a way out of our quandary." Specific proposals had been laid before the expediency council (an advisory body to the supreme leader) he said, a reminder that he has a real role to play. "His demands were in line with what the reformists want but he did not explicitly challenge the legitimacy of the Ahmadinejad government," concluded one veteran Iranian political analyst. "This was an effort to play the role of power-broker – the role that Khamenei should have played but did not." Rafsanjani also stressed the importance of the "republic" in the Islamic Republic of Iran, a deliberate riposte to those hardliners who stand accused of planning an Islamic dictatorship. His references to Ayatollah Khomeni praised the late leader's positive attitude towards ordinary people – a clear invitation to make an unflattering comparison with Khamenei. The sermon was not an overt challenge to the regime, but it did graphically underline the divisions he was warning about: as he was speaking the crowd burst into competing slogans of "death to the dictator" and "death to opponents". No one could have had any doubt who was who. Predictably, trouble erupted in the streets immediately afterwards. 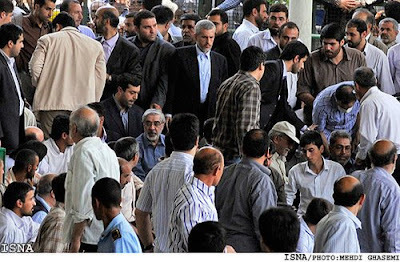 Normally, Friday prayers at Tehran University are a showcase for the regime, which makes sure that thousands of its loyal supporters are bussed in to fill the hall and shout familiar slogans: death to America, death to Israel, and other favourites. That makes it a regular port of call for foreign journalists, invited to witness the peculiarly Iranian combination of religion and politics, prayer and agitprop. Foreign media coverage has been drastically reduced as part of the post-election crackdown. But profound divisions, not defiant unity, are now on open display. 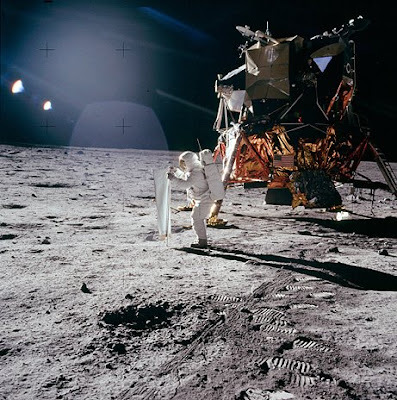 "Apollo 11 astronaut Edwin Eugene "Buzz" Aldrin deploys a foil sheet for collecting solar particles near the Eagle lunar lander in July 1969. July 2009 marks the 40th anniversary of the first moon landing. Today Aldrin advocates a return to space targeted at Mars and other long-distance exploration missions." I am listening to Clint Mansell's haunting score to Duncan Jones' film Moon. It seems fitting 40 years after Buzz Aldrin and Neil Armstrong stepped on the moon that a richly nuanced and psychologically motivated film has been created by the son of the man who gave us Space Oddity in November 1969 in the wake of the first moon landing. "First there was Neda. Then there was Sohrab. Now there is Taraneh." 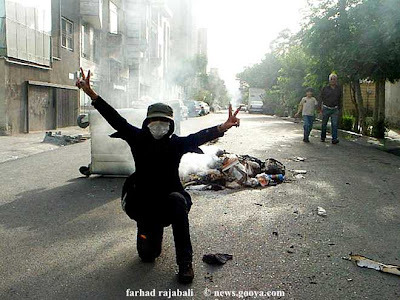 "The names and stories of the Iranians who have been brutalized or killed in the aftermath of the post-election protests are gradually seeping into a memorial vault of the faces of suffering and endurance in the name of sociopolitical reform. 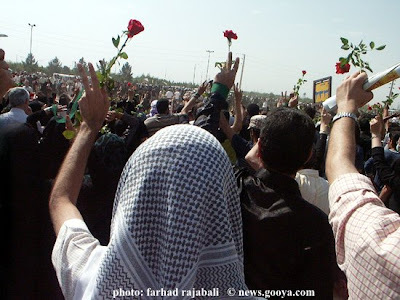 On Friday July 19, a large group of mourners gathered at the Ghoba mosque in Tehran to await a speech about the martyrs of the post-election protests by presidential candidate Mir Hossein Mousavi. 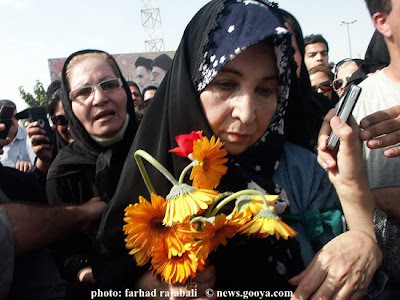 According to one Iranian blog, 28-year-old Taraneh Mousavi was one of a group of people that was arrested by plainclothesed security forces for attending the gathering. 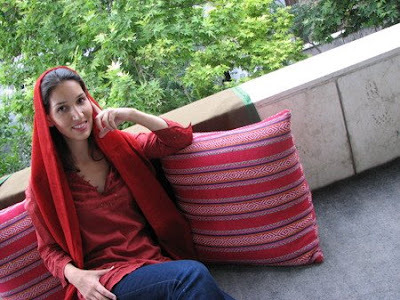 Taraneh, whose first name is Persian for "song", disappeared into arrest." Thanks to Delphine Minoui in Tehran for Le Figaro and also Jahd Khalil in Beirut for the Los Angeles Times for linking to my post on Rumi and U2. "Le blog de Delphine Minoui, correspondante du Figaro à Téhéran, répond à l'envie d'aller au-delà des titres effrayants de l'actualité. Il donne la parole aux hommes et aux femmes qui rythment le quotidien du Moyen-Orient." and Jahd Khalil's site Babylon & Beyond provide important information and insight into Iran and the Middle East. I am indebted to their journalistic bravery, The pen is truly mightier than the sword. The text reads “Listen! Listen! Listen!” which one blogger attributed to "The Song of the Reed Flute," by famous Persian poet Jalaladdin Rumi. Persian poetry and Rumi in particular are some of the strongest sources of Iranian national pride. The history of a violent crackdown behind the original song coupled with Rumi adds some intellectual weight to the visual spectacle of a rock concert. 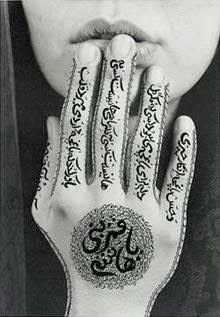 Sussan Deyhim's haunting vocals grace the soundtracks to many of the moving films of Iranian-American artist Shirin Neshat. In an interview with Tyler Green, Shirin Neshat said,"I try to find beauty in the middle of the horror, and vice versa," she says. "Sometimes, really horrible things — you can turn into a weapon of beauty." Après Barcelone et Milan, le groupe de rock irlandais était au Stade de France, ce 12 juillet. Pendant le concert, la scène était inondée de lumière verte, tandis qu'un poème de Rumi - poète soufi du 13ème siècle - défilait au rythme de « Sunday, bloody Sunday » (une chanson très symbolique, puisque composée à la suite d'une répression violente contre un rassemblement pacifique au Nord de l'Irlande). Édouard Manet's "Rue Mosnier" was painted two years before July 14th was declared the French national holiday in 1880. The holiday is known as the Fête Nationale in France and commemorates the Fête de la Fédération of 1790, held on the first anniversary of the storming of the Bastille prison in Paris by an angry mob on 14 July 1789, sparking the revolution that rid France of its monarchy. Manet painted the scene as if he is looking down from his second story studio onto the flag decked street below. Manet's brush is fluid and the color scintillating but the weary amputee on crutches, perhaps a war veteran from the disastrous Franco-Prussian War of 1870-1871, is the figure with which we enter the painting. 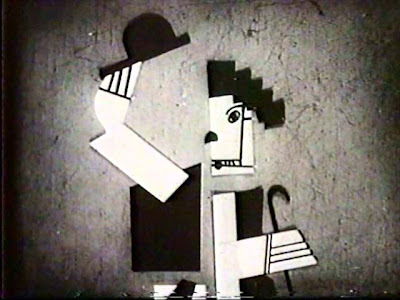 In essence we as viewers enter the scene carrying a ladder just behind the man on crutches bearing the "costs and sacrifices" of nationalism and national pride. With this in mind, the swirling strokes of red, white and blue that make up the French tricolor flag are not as joyous as a cursory glance would suggest. 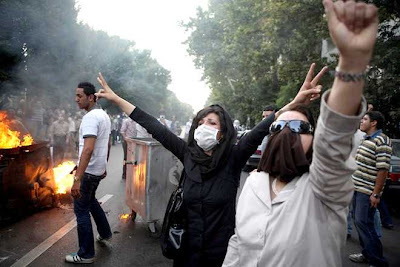 And also on this Bastille Day, I look forward to a future Evin Day in Tehran, when that horrible prison is at last closed down. 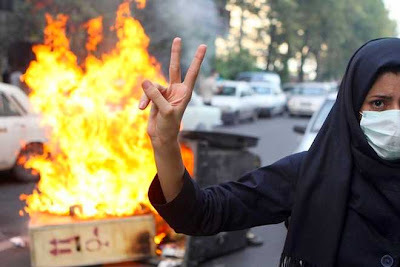 In the United States and France we celebrate our freedoms and our revolutions and we remember the brave souls fighting with words - tweets and blogs - against tyranny in Iran.
" The French government declared June 30, 1878, a national holiday: Fête de la Paix (Celebration of Peace) which marked France's recovery from the Franco-Prussian War and the divisive Paris Commune that followed. The urban street was a principal subject of Impressionist and Modernist painting; many artists aimed to show not only the transformation and growth of the Industrial Age but how it also affected society. Manet's eyes saw both elegant passengers in hansom cabs and, in the foreground, a worker carrying a ladder." "Pompeii, especially, with its grand murals and flourishing gardens haunted by the dark shadow of Vesuvius, has always suggested uncomfortable parallels with our contemporary world, especially here in Southern California, where the sunlit life also turns out to have dark shadows in which failure and death lurk at the edge of consciousness. Now, in these times, we have even closer parallels with those ancient, beautiful, affluent people living the good life on the verge of annihilation." Eleanor Antin's film and photo work, Classical Frieze, re-imagines Pompeii and the classical Roman world as if seen through the eyes of a contemporary filmmaker paying homage to the sword and sandal film epics of the 1950's which are then viewed through a scrim of French neoclassical painting from the 1800's. Eleanor Antin's work was chosen to illuminate a contemporary viewpoint or perhaps fantasy of the Roman world and is featured alongside LACMA'S current exhibition Pompeii and the Roman Villa: Art and Culture around the Bay of Naples. Art21 on PBS describes Eleanor as "a cultural chameleon, masquerading in theatrical or stage roles to expose her many selves." Eleanor has a long and influential record as a visual and performance artist, as well as a filmmaker and photographer. Eleanor Antin "delves into history—whether of ancient Rome, the Crimean War, the salons of nineteenth-century Europe, or her own Jewish heritage and Yiddish culture—as a way to explore the present. " I find Eleanor's Classical Frieze to be lightly provocative and very humorous. At the same time, the work which is ravishing in its color reminds me of the rich chroma in David Lynch's Blue Velvet. In that film and Antin's work, as Eleanor suggests," the sunlit life also turns out to have dark shadows in which failure and death lurk at the edge of consciousness" Antin sees that "Pompeii, especially, with its grand murals and flourishing gardens haunted by the dark shadow of Vesuvius, has always suggested uncomfortable parallels with our contemporary world, especially here in Southern California, ... Now, in these times, we have even closer parallels with those ancient, beautiful, affluent people living the good life on the verge of annihilation." "Pompeii and the Roman Villa illustrates how the Trojan War and the death and wandering of the great Greek heroes were the moral and aesthetic tropes of Roman culture. Whereas for us, the romance of the Roman Empire, with its deliciously decadent affluence and military power, lies deep in modern Western consciousness. The great 19th-century colonial powers that preceded us saw themselves as the new Rome, bringing civilization to primitive peoples, not unlike the way we see ourselves today. At the same time, we are uneasy and haunted by the great empire that owned but then lost the world."